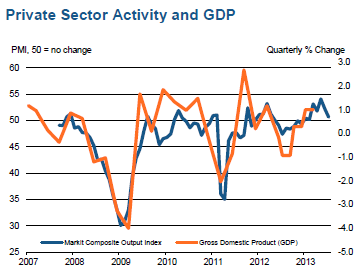 "The Japanese service sector continued its nine-month sequence of growth in July, but the rate of expansion weakened. This follows a period of particularly strong performance relative to the survey history. Whether the short period of recovery will continue remains to be seen; but with the latest data showing employment and new orders stagnating in July, the outlook is distinctly less positive than reported in previous surveys." So Abenomics remains in the spotlight. What's he going to propose next if deflation in prices remains?